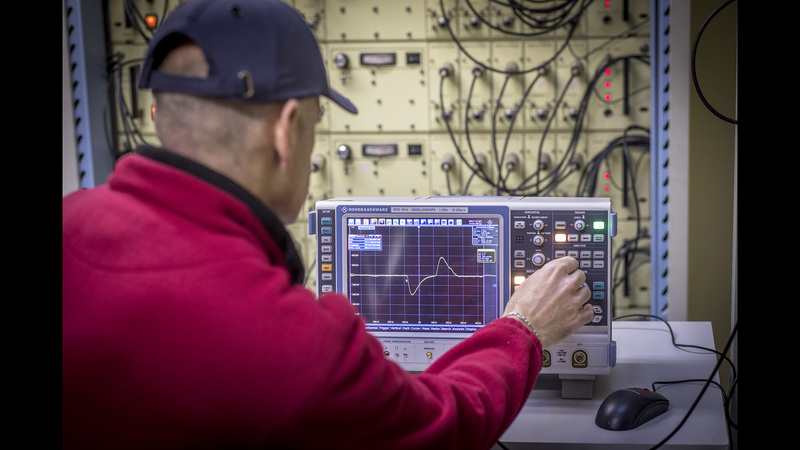 Created in 2000, the objective of the Cabri International Program (CIP) is to study the behavior of nuclear fuel rods and cladding during a reactivity-injection accident (RIA) in a pressurized water reactor (PWR). ​The Cabri international program started in 2000 to study the behavior of nuclear fuel rods, their cladding in particular, during a reactivity-injection accident (RIA) in pressurized water reactor. 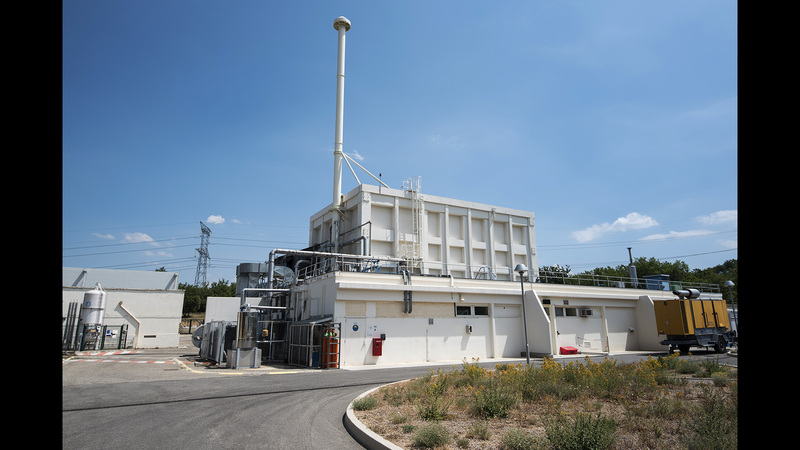 It is part of a set of programs led by IRSN on nuclear fuel behavior. Under the auspices of the OECD Nuclear Energy Agency, this program overseen and cofunded by IRSN brings together partners from France (EDF and CEA) and twelve foreign countries (Czech Republic, Finland, France, Germany, Japan, Slovakia, South Korea, Spain, Sweden, Switzerland, United Kingdom and the United States) representing safety authorities, nuclear licensees and research laboratories. ​A reactivity-injection accident (RIA) includes a rapid, sudden and local rise in neutron flux, which results in an increase in nuclear power due to fission and causing fuel temperature to rise rapidly. pellet-cladding mechanical interaction (PCMI) phase, when the cladding is still cold and the fuel expands significantly, resulting in high mechanical stress on the cladding;failure due to excessive deformation during the post-departure from nucleate boiling (DNB) phase, when the cladding has resisted the PCMI phase and significant cladding deformation (ballooning) occurs due to the degradation of the cladding-coolant heat exchange coefficient and a rapid rise in cladding temperature. Since the first failure mode does not depend on coolant conditions, it can be studied in thermal hydraulic conditions that are not representative of a PWR. The second failure mode depends heavily on thermal hydraulic conditions and can only be studied experimentally in PWR conditions. This constitutes the major challenge of the CIP. 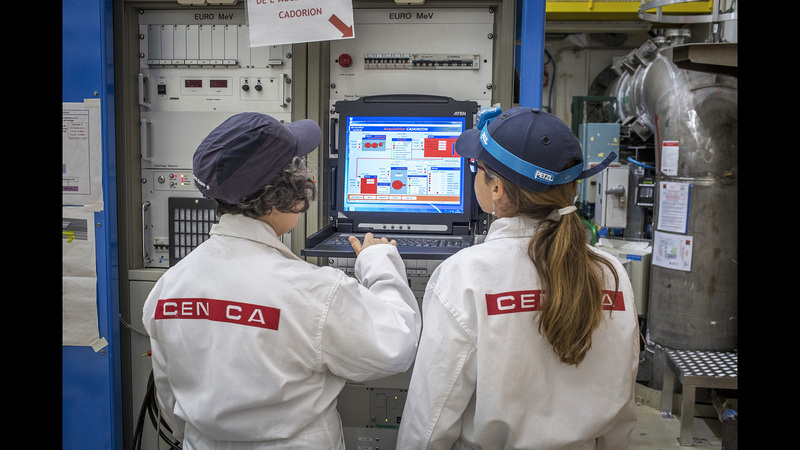 ​​Léna Lebreton and Nathalie Monchalin, experimenters in In pile experimental research laboratory (L2EP), at the control station of IRIS station located in CABRI reactor hall. understand fuel rod behavior in an RIA situation, particularly in the event of cladding dryout or cladding failure during the transient;provide quantitative information for the development and validation of simulation tools (including IRSN’s SCANAIR software);study the behavior during a RIA of new types of cladding and fuel that offer improvements in other situations. The program may also provide information to confirm certain new safety criteria defined by EDF for the short term phase of the rod ejection accident and which were addressed in an investigation by IRSN presented to the Advisory Committee for Nuclear Reactor Safety in June 2017. 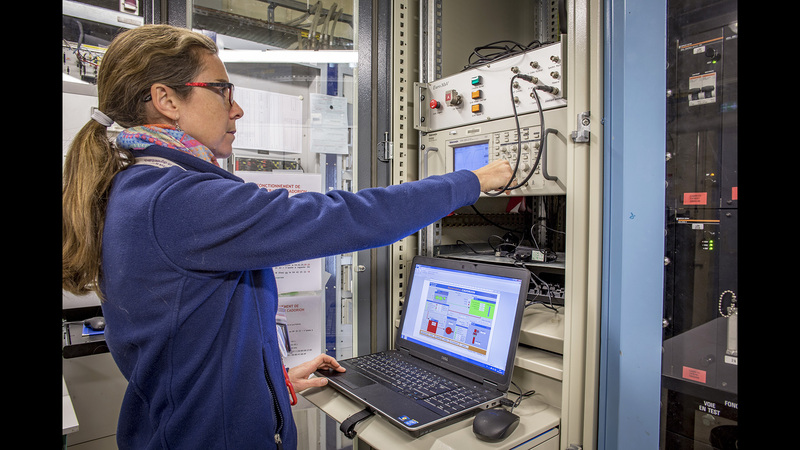 ​Nathalie Monchalin in front of remote control station of nondestructive measuring equipment of IRIS (installation for radiography, imaging and spectrometry), including the control of the X-ray imaging measurement of the nuclear fuel rod. CIP includes a total of twelve tests. The first two reactivity injection tests on irradiated fuel rods were performed in 2002 in the Cabri reactor equipped with a "sodium loop", i.e., in which the coolant is liquid sodium. The loop represents the reactor coolant system in which the reactor coolant circulates. 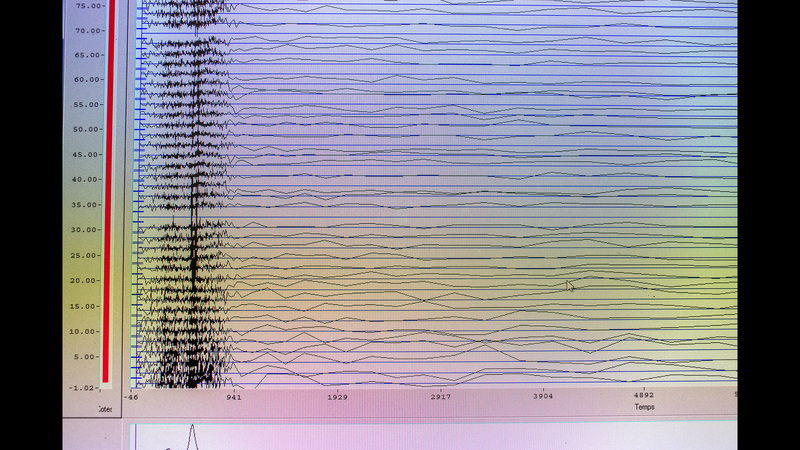 The two tests provided an opportunity to study phenomena that do not depend on the nature of this coolant (PCMI phase). 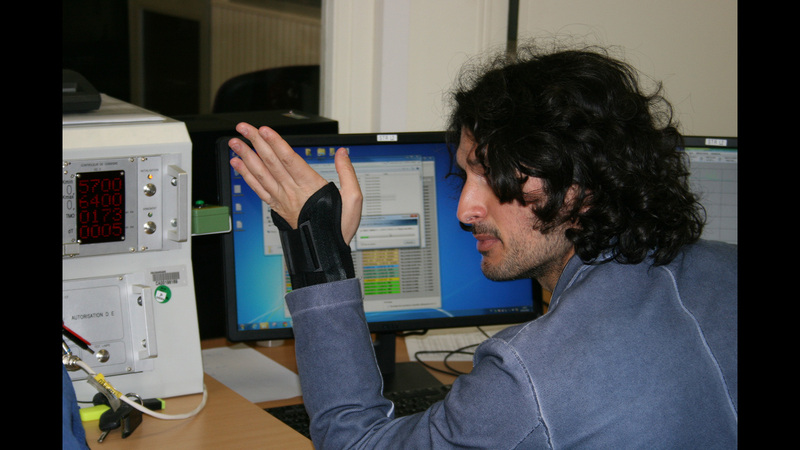 Jérôme Guillot, head of In pile experimental research laboratory (L2EP) in charge of CIP tests, adjusts the screen to monitor the hodoscope measurements. 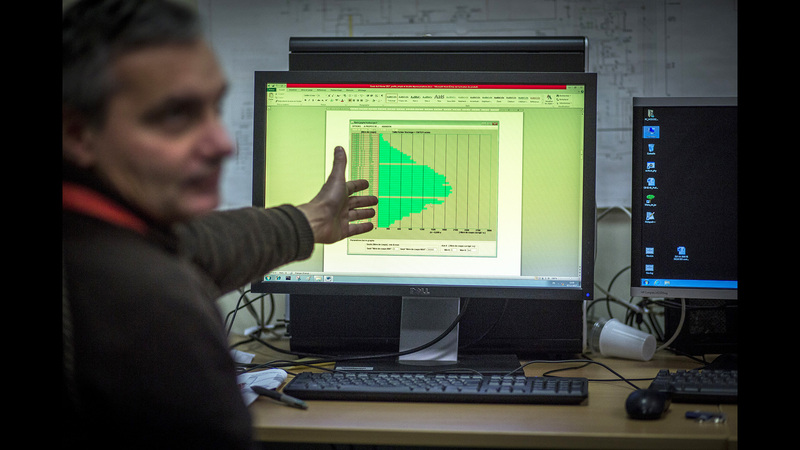 ​Salvatore Mirotta in the tests control room. Primary reactor power: 100kW ;Power transient duration: 10 à 100 ms ;Maximum transient power: about 20 GW ;Injected energy: till 200 MJ. 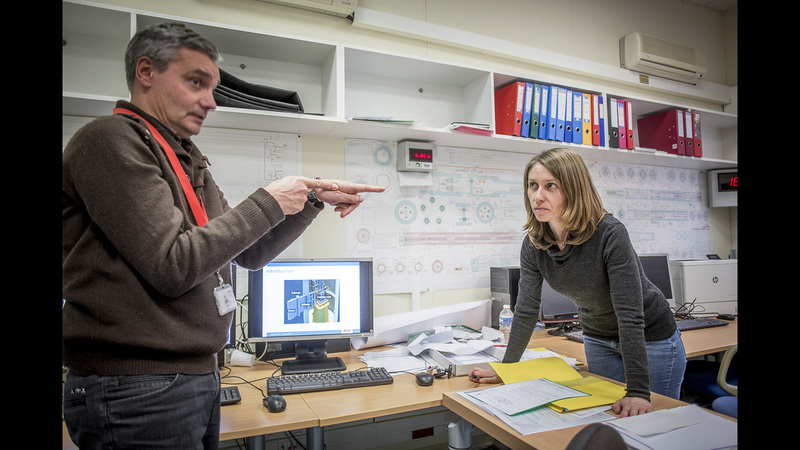 ​Vincent Chevalier, engineer at In Pile Experimental Research Laboratory (L2EP), and Christelle Manenc, CABRI CIP project manager at L2EP, in the tests control room. (c) Jean-Marie Huron / Médiathèque IRSN.